Tim Barrow and Anna Russel-Martin in Nora: A Doll’s House at Tramway, Glasgow. Design, Tom Piper; lighting design Lee Curran. Photo: Mihaela Bodlovic. Henrik Ibsen’s A Doll’s Houseis often described as having “caused outrage” upon its premiere in 1879. 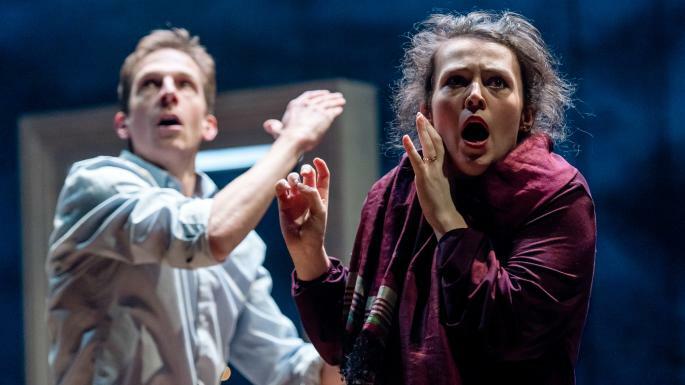 The work earned its controversial status for its portrayal of Nora, who at the play’s climactic scene chooses to leave her marital home, husband and three young children in order to prioritise her own needs, wants and safety. Stef Smith’s Nora: A Doll’s House, commissioned for the Citizens Theatre’s Citizens Women Season, grapples with this moment and the outrage it caused. Re-siting Nora’s story, Smith weaves its titular character into three significant cultural moments in the resistance of women to patriarchy: women’s suffrage, the “swinging 60s”, and the #metoo movement. In a finely written turn, these three concurrent narratives are weaved together, stitching these different Nora’s, different moments, into the same fabric. History has focused on the outrage of audiences, but Smith’s adaptation shifts the rage to the centre of the play, such that it emanates from the stage outwards. Are you still outraged by Nora? What are you outraged about now? A more difficult question emerges – Have you, have we, changed? Nora is a structurally complicated piece, wonderfully so. Nora is performed by Maryam Hamidi (1960s Nora), Anna Russel-Martin (Present Day Nora) and Molly Vevers (1919 Nora), who then double up to play Nora’s old friend Christine in different time periods. These changes are written and presented in such a way that it is difficult in some moments to know where one timeline ends, and another begins. The character of Christine is signified through the wearing of a scarf and in one scene an ambiguity is left to hang, as the actor playing Christine speaks in character before wearing her pop. For maybe five seconds, I am brilliantly confused, unsure who is speaking. There is a richness to this structure, to the way the work layers over and within itself. Smith, in an interview with Joyce McMillan, describes this dramaturgy as possibly more feminine. The qualities of how time is presented, how historical events, present and past, personal and public, permeate and co-exist feel like a significant departure from the three-act structure of the male-authored source text. There is a quality, a way of speaking, of being heard, that demands attention. Conversely, it is in the moments where the work is at its most obvious, most clear, for example when the three Nora’s speak significant lines in chorus, that this depth, this weave, disappears. The adaptation is radical and at its best when it allows its audience to be confused, to meet all of its selves at once. The design of the space underscores the complexity of the piece. Performed on a thrust, with the audience on three sides, the stage is lightly furnished with three chairs. There are three doors, through which the three Noras first appear, behind them an ice river with a Christmas tree and piano at either end. Two of the doors are – a little oddly – not used after their first appearance, likewise the tree and the piano, becoming solely visual references, seemingly far removed from the action. Overhead the lighting is atmospheric, a darkly hued pink rectangle of light. Together, this creates a clear space, which the women never leave, yet the male characters continually walk through and depart. At a step down from the stage, out with the playing space, is a ledge. At moments one of the women may stand there, ghost-like, a Nora out of time, watching from before, after and aside. These moments are fleeting but a feeling of trapped-ness is just about graspable. Perhaps owing to the fact that it is early in the run, the play is still finding its position within this space. I can’t tell what was intentional, what was a mistake, what could happen next – but this space on stage is one that affords a lot of possibilities. Thematically the work is at its most incisive towards the end. A great deal of time is given over to making clear the similarities between time periods, between the struggles of women to dismantle the financial, emotional and physical controls of patriarchy across the ages. Yet the work really comes alive when the differences, particularly those that are most affronting to the audience sat in Tramway that evening, come to the fore. At the work’s close, with the three Nora’s having made their escapes, chosen to leave, they all meet different outcomes. Anna-Russel Martin’s present-day Nora, seeking temporary refuge in a bus stop, remarks that she “doesn’t know where the nearest shelter is, not anymore.” Nora sees her partner coming after her but there’s nowhere for her to go, no support network in place. She instead has to steel herself and hold onto the commitment that one day she’ll be away from him. In a few lines, Smith draws a link between the austerity politics of the current UK government and the impact this has on women’s ability to leave situations of domestic abuse. It is here, in the last five, the work comes to life and the audience are more directly confronted with the reality that, for all the progress that has been made, women’s position within capitalist patriarchal structure is endlessly precarious. This is really brilliant, really interesting. The only shame is that the play really gets into its stride just as it comes to an end. Nora: A Doll’s House runs at the Tramway, Glasgow, until 6 April. More info here.